ROB Beattie isn't putting pressure on daughter Carlee to win a medal at the London Paralympics in August and September. "I am just proud she has made it to London," Rob said. Yesterday, the Warwick athlete was one of 36 selected with a further seven nominated for selection. She debuted at the 2008 Paralympics in Beijing. Carlee goes to London with the world record in long jump in the F46 classification. Rob said Carlee had to give up work to concentrate full-time on London. "She has done it tough with injury, but is extremely focused," Rob said. He is one of five family members heading to London for the games. His wife Jeanette was born in England so there will be some sightseeing as well as Carlee's events and a bit more athletics. "We are really keen to see the wheelchair rugby; they hit pretty hard," Rob said. "Some of Carlee's friends have bought tickets for us; we are now trying to get tickets to the opening ceremony." As the world record holder at 5.89m, Carlee is favourite for the long jump on September 2. It is still to be decided if she will compete in the 100m (August 31-September 1) and 200m (September 4-5). "It is wonderful to be in the team again," Carlee said. "My aim is to win a medal. I plan to compete in some lead-up competitions in mid to late July and then a couple of competitions during our three weeks in camp in Cardiff, Wales, in August." The Paralympian attended St Mary's and Assumption before finishing her education at Warwick High. Warwick High health and physical education department head Scott Thompson recalls Carlee at the school. "I remember her as a top sprinter and she also specialised in long and triple jumps," Thompson said. "At school carnivals, Carlee's best sprint event was the 200m, it was nice to watch her style on the curve. 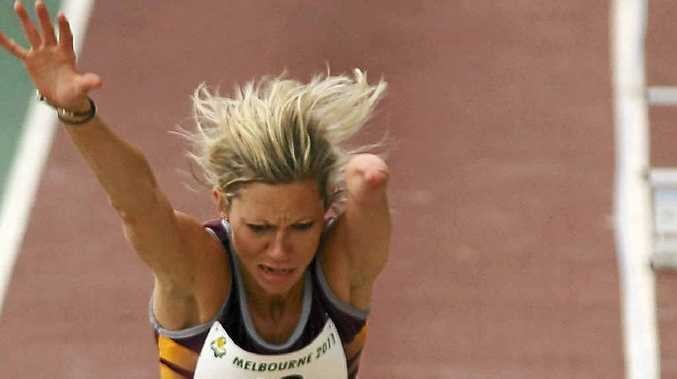 "I am not surprised she has made it to the Paralympics. Carlee has done really well and persevered with her sport."